​BELLAIRE - KBS Strategic Opportunity REIT has signed nine leases totaling 60,227 sf at West Loop I & II in Bellaire with tenants in the medical and financial industries. 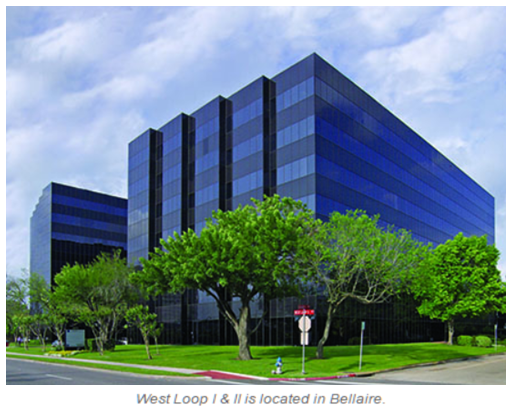 Bellaire Dermatology an d Eye Center of Texas signed the two largest leases, at 16,334 sf and 15,120 sf, respectively. Located three miles west of Houston’s Central Business District, West Loop I & II is a Class A, two-building office complex with 313,873 rentable sf. It sits on a 5.6-acre office property with an eight-story parking garage and a covered walkway. The property is near the residential communities of Bellaire and West University with access to I-610. Amenities include structured parking, a deli, park and on-site security. ​​See Houston Office Market Data.